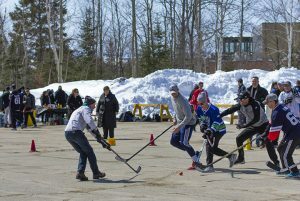 The inaugural Shamrock Cup Road Hockey Tournament was a smashing success, raising over $1000 for the Paul Nelson Memorial Scholarship. Six teams battled it out for the coveted Shamrock Cup, with the Dark Knights eventually taking home the glory. The event also featured a chuck-a-puck competition, as well as bbq lunch and t-shirt sales. Organizers would like to thank all those who participated and contributed to making the event a success. The Paul Nelson Memorial Scholarship is awarded annually to a third-year Bachelor of Physical and Health Education (BPHE) student in Nipissing’s PHED 3016 Coaching course who exemplifies excellence in the development of their coaching philosophy. Paul Nelson was a hard working and well-respected student in Nipissing’s BPHE program. Paul was actively involved in the community, specifically in volunteering his time with his local fire department. He died in 2011 in a tragic accident while responding to a fire call. To honour his memory, Nelson’s friends and Nipissing BPHE faculty have created a scholarship in his name and raise funds through an annual Paul Nelson Memorial Ice Hockey Game. The Shamrock Cup Road Hockey Tournament in just one way to get involved and show support in memory of Paul Nelson.